Il Gratis può essere una buona strategia ? AICEX: offrire prodotti e servizi gratis può essere una eccellente strategia per incentivare up-selling, cross-selling, brand awareness, ecc. 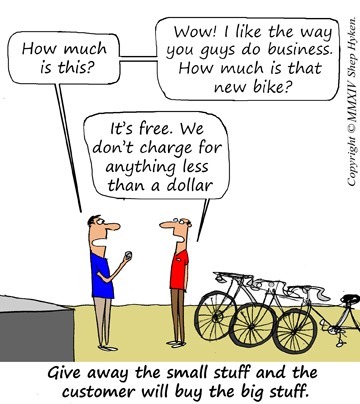 Sometimes one of the greatest ways to provide great customer service is to give something of value away for free. It doesn’t have to be anything big or expensive. It can be something small. Really small. It just has to be valuable to the customer. Think about the owner of the restaurant that buys his regular customers a drink or a dessert. Actually, that’s not small enough. I’m talking really small. Something that costs a dollar or two; maybe less. Ron’s story reminded me of Chris Zane, who owns a bike store in Connecticut. Known for his amazing customer service, one of Chris’s tactics is to not charge the customer for anything that costs less than a dollar. For example, a customer who needs a master link, which is a small part that holds the chain together, doesn’t have to pay for it. Zane says, “The cost to me is virtually nothing. We’re not going to chase the pennies — we’re looking at the long-term effect of giving someone a master link. And you should see the look on people’s faces.” It turns out the tactic of free costs Zane less than $100 annually. A small price to pay for loyal customers who are worth thousands of dollars over time. By the way, you can read about Zane’s philosophy about this in his book, available on Amazon.com. Sometimes there is no monetary value at all. It’s just a little effort, taking time out to do something nice for a customer, or a potential customer. I’m reminded of one of our newsletter subscribers who sent in a story about how he had car trouble and was stranded on the road. A limo driver was passing by and asked if he could drop him off at a service station, at no charge. He was just being a Good Samaritan. It paid off because the gentleman with the car trouble owned a company that now hires his new friend to drive him to and from the airport. Sometimes free can be a great customer service strategy. It adds value, promotes good will and builds trust with your customers. All good things that can eventually lead to customer loyalty! This entry was posted in Customer Experience, Customer Loyalty, Customer Service Strategies and tagged adds value, build trust with your customers, customer service strategy. Bookmark the permalink. Le attività per il ROI o un ROI per le attività ?